"Harrison Wells" has been captured but Eobard Thawne has one ace left up his sleeve. The particle accelerator he built has been reactivated and could be his ticket home with Barry Allen's help. And in exchange for that help Thawne's ready to give Barry Allen what he wants most - a chance to go back in time and stop his mother's murder. But is Barry ready to let his greatest enemy go in exchange for the life he's always dreamed of? It's impossible to single out any one actor as being particularly good in this episode. The script gives everyone in the cast at least one moment to shine and they are all radiant stars. The script for this episode is very well crafted, giving all of the core cast at least one great moment or quotable line. The use of Don't Dream It's Over for Ronnie and Caitlin's wedding is a perfect choice of music. The special effects in the Speed Force time-travel sequence and the last minute of the episode have reset the bar for what superhero television shows can accomplish. The episode's opening "My name is Barry Allen" speech is switched out in this episode, with Grant Gustin delivering the words in a more somber tone and the speech ending with the words "That day is today." instead of "I am The Flash". Eobard Thawne is disappointed that Barry didn't deliver him Big Belly Burger when he came to visit him in his cell - a reference to a popular fast food franchise in the DC Universe. Eobard Thawne tells Barry that he was born 136 years in the future. In the original comics, Eobard Thawne was from the 25th Century - not the 22nd Century. Eobard Thawne mentions The Speed Force - the extra-dimensional energy field that all speedsters in the DC Universe can tap into to fuel their powers. Thawne's belief that he can change Barry's past by causing a tragedy is very in-line with the motivations of Hunter Zolomon - the second Reverse Flash. One possible reason why Thawne lost his connection to The Speed Force after altering the timeline in the hopes that the death of Nora Allen would cause Barry to never become The Flash is the fact that - in some versions of The Flash's story - Barry Allen IS The Speed Force. If this is the case in the DCTVU, then preventing Barry from becoming The Flash would likewise destroy The Speed Force, logically robbing Thawne of his powers. Henry tells Barry that he might understand his objections to Barry's trying to change the past if he were a father himself. In the comics, Barry does indeed become the father of twin siblings - one boy and one girl - who gain his powers and become known as The Tornado Twins, Don and Dawn Allen. Stein says that when Barry collides with the hydrogen proton he plans to shout something like "Eureka!" or "Excelsior!" Eureka is Ancient Greek for "I have found it" and was reportedly shouted by Archimedes upon his discovery of a method to accurately measure the volume of an irregular solid. Excelsior is a Latin word meaning "ever upward" and is also the trademark catch-phrase of legendary comic writer Stan Lee. Cisco calls the time machine that Eobard Thawne was constructing a Time Sphere. The reason Thawne smiles at this is because that is the actual name of the ship in question. The Time Sphere is the name of the vehicle used by the time-traveling hero Rip Hunter in the comics. Thawne later refers to Rip Hunter as the inventor of The Time Sphere and notes that he was "an interesting man". Thawne explains that the reason why Cisco is able to remember his death in an altered timeline is due to his having been given powers in the particle accelerator explosion that allow him to "see through the vibrations of the universe". In The New 52 universe, Cisco Ramon developed the power to emit sonic vibrations as well as some extra-sensory powers after a similar accident involving the destruction of advanced technology. Cisco quotes Douglas Adams, saying "So long and thanks for all the fish" in response to the revelation that they could potentially destroy the world using the particle accelerator. These were the last words the dolphins communicated to humanity before leaving the Earth just before it was blown up in The Hitchhiker's Guide To The Galaxy. Another nod to the number 52 - according to Thawne's calculations, Barry will only have 1 minute and 52 seconds to save his mother before the wormhole closes. Eddie says that he canceled a date with a dancer named Katie Rogers on the night that he first met Iris West, stopping the purse snatcher who had grabbed her backpack. Katie Rogers was also the name of the heroine of a 2009 graphic novel - The Trouble With Katie Rogers - published by Ape Entertainment. The song playing at Caitlin and Ronnie's wedding is Don't Dream It's Over by Crowded House. The song is about two people coming together and believing in their love, despite circumstances contriving to separate them. Barry has a number of visions of both the past and the future as he enters into The Speed Force. Among these are images of a bronze statue of himself. This is a reference to The Flash Museum, which had such a statue in front of it. The Flash Museum, as its name implies, was a museum devoted towards the life of The Flash, his enemies and his allies. Barry also has a vision of a pale-skinned, blonde-haired woman with ice powers. It appears to be Caitlin Snow, having assumed the identity of Killer Frost - the heat-draining super-villain who shares her name in the comics. Right before he sees the night his mother died, Barry sees himself, The Atom, Sara Lance and Captain Cold facing off against a giant robot foot. This scene is taken from preview footage from the trailer for the upcoming Legends of Tomorrow TV series. A metal petasos-style helmet with wings on the sides flies out of the wormhole, which Thawne takes as a sign that he should go. This might be because said hat is part of the uniform of Jay Garrick - The Flash of Earth 2 in the pre-Crisis DC Comics Universe. A number of bystanders are seen watching the singularity start to devour Central City. Among them are Len Snart, Captain Singh, Henry Allen and a young woman named Kendra Saunders, whom we know will become Hawkgirl in the upcoming Legends of Tomorrow show. Thawne says he needs Barry to rupture the space-time barrier and create a stable wormhole which he can use to return to his home time. Professor Stein notes that Thawne's actions have already changed the past, creating the parallel universe in which The Flash TV show takes place. Thawne's plan is for Barry to collide with a hydrogen proton moving at the speed of light in STAR Labs' particle accelerator. This will punch a hole in reality and create a portal connecting their time with infinite times - a wormhole through which one could travel backwards to the night Nora Allen died or forward in time to Eobard Thawne's time. This requires Barry to run fast enough to trigger the reaction - too slow will crush him like a bug splatting against a windshield. Professor Stein says that Barry will have to move at Mach 2 in order to time travel using the particle accelerator. Mach 2 is 1,522.4141 mph. Ronnie notes that the tiles Wells set aside for building a time machine are made of tungsten. Cisco notes that tungsten does have the highest melting point of any element. Unfortunately, tungsten dust is flammable, meaning that the pressure of the wormhole could cause a hole to be melted into the exterior of the time machine's casing and trigger an explosion due to temporal shearing. Cisco theorizes that Thawne fits his costume inside of his ring using compressed micro-tech. Thawne says that a cobalt resin being used to cement the tungsten tiles will prevent degradation in conditions of extreme heat. Thawne says that Cisco was altered by the particle accelerator explosion and is able to see through the vibrations of the universe. This is why Cisco is able to retain traces of another timeline in his memory. Stein notes that even if Barry can hit the hydrogen particle at the right speed, the resulting wormhole could collapse into a singularity - i.e. a black hole. This would be a global catastrophe. When Barry and Joe have their second talk about whether or not Barry should attempt to change the past, Barry sits on "the cosmic treadmill". In the comics, The Cosmic Treadmill was the device that allowed Barry Allen to time-travel. According to Thawne's calculations, Barry will have 1 minute and 52 seconds to save his mother and return home once the wormhole stabilizes. Though it isn't named as such, Eddie's method of killing Eobard is a classic example of The Grandfather Paradox - a classic physics problem which states that a time traveler could not go back in time and kill their own grandfather. The act of killing their grandfather would cause them not to exist, which therefore means they could never go back in time to kill their grandfather in the first place. The paradox would not, however, appear to stop a man from acting on future knowledge to prevent his future ancestors from being born. Stein notes that the accretion disc has already assembled once they get outside the STAR Labs building. The accretion disc the fused material that forms an orbital motion around a singularity. It has an energy level of at least 6.7 tera-electronvolts. Barry: My name is Barry Allen and I'm the fastest man alive. When I was a child, I saw my mother killed by something impossible. My father went to prison for her murder. Then an accident made me the impossible. To the outside world, I'm am an ordinary forensic scientist, but secretly I use my speed to fight crime and find others like me. And one day I'll find who killed my mother and get justice for my father. That day is today. Barry: Why were we enemies? Eobard: It doesn't matter. It doesn't matter anymore. What matters is that neither of us was strong enough to defeat the other. Until I learned your secret. I learned your name. Barry. Allen. And finally I knew how to defeat you once and for all. Travel back in time. Kill you as a child. Wipe you from the face of the Earth! But then you - future you, that is - followed me back and we fought. We both landed some pretty solid shots. And then you - future you - got your younger self out of there. I was so mad! And then I thought, "what if you were to suffer a tragedy?" What if you were to suffer something horrible, so traumatic that your child self could never recover? Then you would not become The Flash. And so I stabbed your mother in the heart. And I was free. Finally able to return to a future without The Flash. Only to realize that in traveling back, I lost my way home. Lost my ability to harness The Speed Force and without it I was stuck here. Stranded in this time. Unable to return to my home. And the only way back was The Flash. But The Flash was gone. And so, I created him. Barry: I can save Mom. Ronnie: (To Caitlin) I realized that although sometimes I'm more than one man, I'm not whole unless I'm with you. Barry: What do you think I should do? I need someone to tell me. Iris: I think - that for once your life, Barry Allen, you should stop thinking about other people. I think you should do what's in your heart. Do what you need to for yourself. Cisco: It was an alternate timeline. One that Barry reset. But I never forgot it. It just kept coming back to me. And I can still picture the way you looked at me when you called me a son. And you crushed my heart with your fist. Eobard: Oh, not for killing you. I'm sure I had a good reason. I'm sorry for the fact that you were able to retain traces of another timeline. You're able to see through the vibrations of the universe. Eddie: Dr. Wells made it pretty clear when he told me about the future. I don't matter. As far as history is concerned I don't save the day or get the girl. Martin: And... you believed him? Eddie: He had a newspaper from the year 2024. Martin: And I have a mug that says "World's Best Boss". I doubt my teaching assistant would testify to its authenticity. Barry: You know, I've dreamed my whole life about saving her. Freeing my dad. I never thought I'd have to lose another parent to do that. Barry: Joe, it's true... it's true. I've always been so focused on everything that I lost that night. But I've gained so much too. I was born with one father and that tragedy gave me another. And I don't think I can lose you. Joe: You won't ever lose me. Ever, do you hear me? Ever. Eddie: We've all been so focused on Barry's destiny, I forgot I have one too. And it's you. Iris West. Every moment of my life led to meeting you. Screw the future. Iris: (laughs) Screw the future. Ronnie: Is this actually binding? Martin: My father made me become a rabbi before he would send me to M.I.T. This will be "legit", as the kids say. Ronnie: No kids say that. Martin: Let's not fight on our wedding day. Ronnie: I owe you a real ring. Caitlin: I don't need one. I have everything and everyone that I could ever need right here. If all the events of the past year have led us to this moment, it was worth it. I love you, Ronnie. Martin: I now pronounce you husband and wife. You may kiss the bride. Cisco: May the Speed Force be with you. Eddie: He was wrong, it turns out. I'm a hero after all. Iris: You are, Eddie! You are! You are my hero. Martin: Barry, that event has an energy level of 6.7 tera-electronvolts! It cannot be stopped! Barry: I have to try. Eobard Thawne claims that cows are extinct in his time. Eobard Thawne claims to have been born in the year 2151 - 136 years in the future. Thawne reveals that he remembers an entirely different past with Barry Allen and that he originally came back in time to kill Barry, but then killed Nora Allen in the hopes that the tragedy would stop Barry Allen from becoming The Flash. He was right, but he was depowered in the process and thus forced to recreate the events that turned Barry Allen into The Flash. Barry refers to how he altered time after going back one day in 116. Iris refers to the original name given to Barry - The Streak - which was last mentioned in 105. Caitlin says that Barry has never gone as fast as Mach 2 before. Cisco's theory from 122, that Wells was using the device in his wheelchair to power his super-speed is confirmed. Cisco tells Eobard Thawne about his visions of having been killed by him in the alternate timeline from 115. Thawne, in turn, tells him that the particle accelerator explosion gave him powers and that a great and honorable destiny awaits him. Eddie refers to the conversation he and Eobard had about the future in 121. Eddie's favorite food is the dim sum at Mama Chows. Eddie refers to how he first met Iris, stopping the mugger who stole her backpack in 101. Martin Stein is a Rabbi and apparently legally qualified to perform weddings in whatever state Central City is located in. Caitlin and Ronnie are legally married on the lawn of STAR Labs, with Martin conducting the ceremony. Joe, Eddie, Barry, Iris and Cisco attend the wedding, with Cisco acting as the ring bearer and Iris as the maid of honor. There are three versions of Barry Allen at the scene of Nora Allen's murder as of this episode - a future version of Barry, the ten-year-old Barry and the 25-year-old Barry of "now". Eobard Thawne says "Now run, Barry, run!" as Barry begins his run to the past, in the same manner in which he said those same lines when Barry Allen tried to reverse a tornado in 101. These were also the words Henry Allen said to a young Barry on the night Nora Allen died. 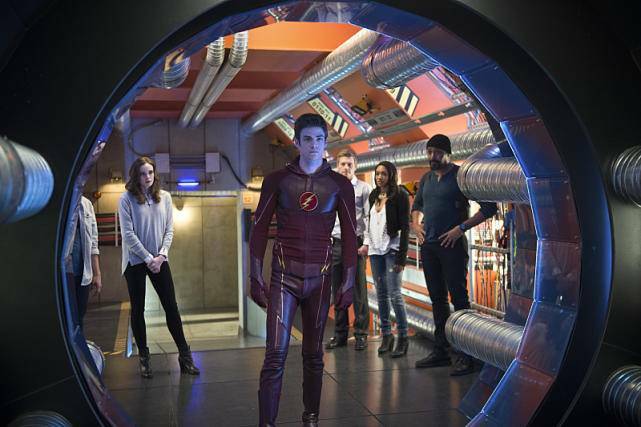 The visions that Barry has while in The Speed Force show him a young Iris and Joe shortly after his mother's death, Caitlin Snow as Killer Frost, The Flash Museum, Barry in prison and an image of The Atom, Sara Lance, Captain Cold and himself facing a giant robot foot stomping down at them before he sees the night Nora Allen died. The future Barry raises a hand and shakes his head at the present Barry, indicating that he shouldn't save Nora's life. Barry decides to obey and hides until The Reverse Flash leaves. He does, however, ensure that his mother does not die alone and reveals his identity to her. Eobard Thawne identifies Rip Hunter as the inventor of the first Time Sphere and says that he was "an interesting man". A metal petasos-style helmet flies out of the wormhole, which Thawne takes as a sign that he should go - a possible reference to The Flash of Earth 2, Jay Garrick. Eddie Thawne shoots himself in the chest, killing himself - an action that causes Eobard Thawne to fade out of existence. His body is later dragged into the re-opened wormhole that forms above STAR Labs after Eobard Thawne is erased from existence. Eobard Thawne refers to several future battles with Barry Allen and how the timeline we've come to know over the past season was the result of his killing Nora Allen. Flawless, save that the uncertainty of the cliff-hanger ending is annoying when we're looking at a four month gap before Season 2 starts.